3D printing the case and preparing your case for assembly is probably one of the more time consuming steps in the process. I've spent hours sanding cases down with 1,000 grit sandpaper, only to have a small part off the case break and you're stuck reprinting and restarting all over again. Taking your time and being gentle during this portion of the project is going to be key. Any time you sand the PLA, I would also recommend you do it over running water or as a wet sand, the quality just ends up much better. I would also recommend starting any sanding on the exterior of the case with 120 grit, moving up to 200 grit, 400 grit, 800 grit, and top it off 1,000+ grit sandpaper. I've found that it may be better just to leave as much of the 3D printed case alone, as it looks best right off the printer. Some color of plastics hide scratches from sandpaper better, for example, gray PLA will turn out very nice sanded. This is the part that can be the most fun, but printing all the parts is cool to see, plus you get to pick out the fun color you want your project to be. I would recommend you print this project with PLA and have your quality of printing set at 0.1 mm or whatever is the lowest setting possible. I wouldn't add supports to the start/select area, as you'll most likely be cleaning up the scars with sandpaper anyway. You can print the power button in a flexible (TPU) style filament. The more time you spend sanding areas for the buttons and creating a smooth feeling interface between the buttons and the case, the better your gaming experience will be. 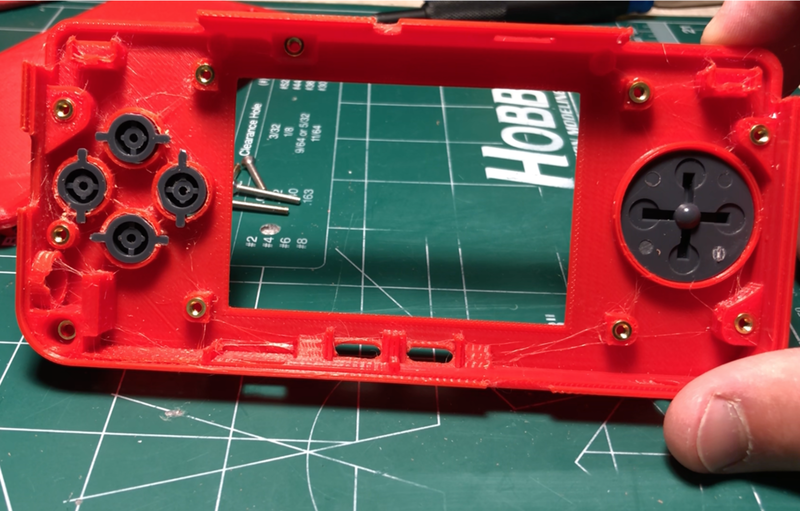 Make sure you sand the start/select button area, dpad button, holes for the ABXY buttons, tops of the standoffs, and prep the plastic holes by pre-threading the screws through them. Sand down the dpad edges! Sanding and cleaning button holes is key. After you've sanded and prepped your case, the next step is to install the threaded inserts for the case. Adding the threads allow you to assemble/disassemble several times and provide a tighter grip when installing screws to hold the parts in the case. You can see how I install all ten (10) these in the GIF below but the one thing you are not seeing is heat. I use a screw to hold the threaded insert when heating it up with a lighter or torch, and then pushing it into the case. Be sure not to get it too hot, or you could damage your case!